This strange animal never ceases to amaze us, both physically and by its abilities. No wonder it has become so popular in the aquarium industry, even becoming officially a pet! 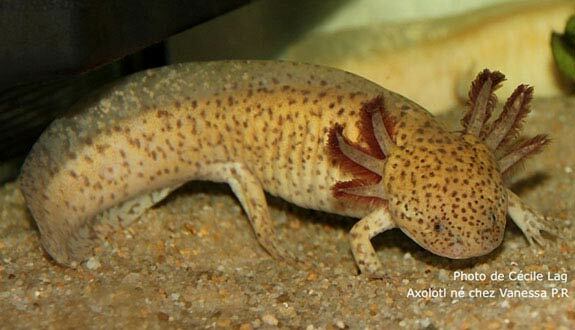 Axolotl is an amphibian with special needs, but relatively accessible. This card will tell you more! How to feed the Axolotl? Axolotl is a carnivore fish. There are foods specifically dedicated to Axolotls that will make a good basic diet. To vary their meals, you can also offer them earthworms, bloodworms, false moths, pike pieces, perch or salmon trout. On the other hand, never give them food containing iodine. 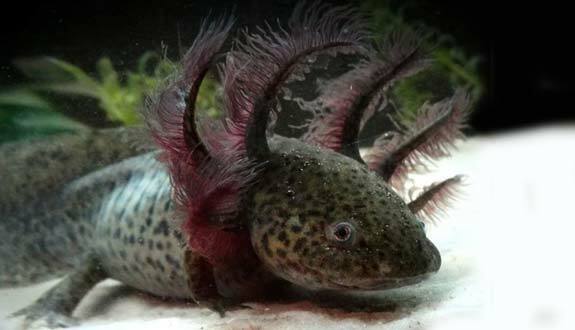 What kind of behavior does the Axolotl have? It is a rather nocturnal animal. Moreover, you will observe increased activity at sunrise and sunset. It lives mainly at the bottom of the tank. Besides, it walks more than it swims. 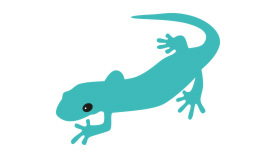 If an Axolotl stays constantly near the surface, it is a sign of distress. Check its state of stress, if it is sick, and check the water parameters. Note that it is very sensitive to stress. 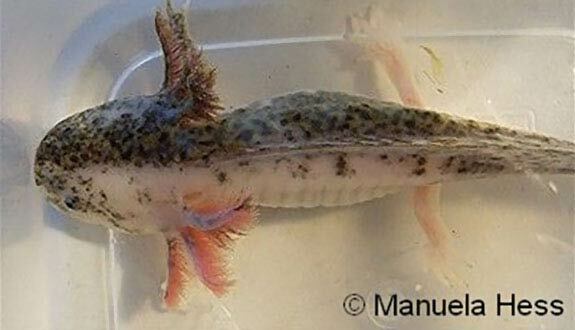 Who can live with the Axolotl? A specific aquarium is highly recommended. It is naturally lonely, and will not suffer from being alone. However, the company of its congeners is a plus. In this case, plan an aquarium of at least 120 liters (26 imp gal / 32 US gal) for 2 individuals because they are quite territorial. To put it simply, it is better to avoid cohabitation with fish. 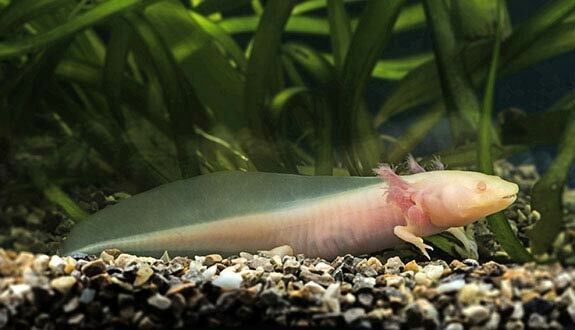 In fact, small fish are used as meals, and the larger ones may want to «eat» the gills of the Axolotls (because of their resemblance to mudsworms), which could then see the onset of repeated infections. Even snails pose a danger because Axolotls could swallow and choke (except the Pomacea that could work if the aquarium is big enough). Some still maintain Axolotls with Guppy, Cardinal Fish, Gambusia, Danio rerio or Platys. Be aware however that some will disappear from time to time! The best cohabitation is undoubtedly the one with its congeners. 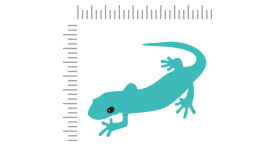 However, be careful with their size difference between individuals, which should not exceed 5 cm (2 inches). It is not aggressive, but because of its poor eyesight, it can happen that it nibbles the paw or the gills of its congeners. This remains relatively minor, since the injured will push the missing part over time. 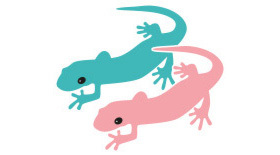 How to breed the Axolotl? Pretty easy and does not necessarily require the intervention of the aquarist. The Axolotl are sexually mature from a year or when they reach about twenty centimeters. The colour of the fingertips changes then: it goes from light to dark or from dark to clear. Before this age, it is difficult to differentiate between the sexes. 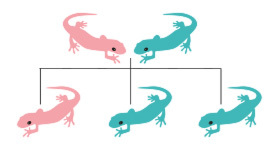 In general, the female is «wider» than the male. The cloacal region of the male is inflated and long, while that of the female is flat and short. 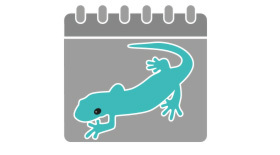 If your Axolotls have trouble reproducing, lower the temperature around 10/15 °C (50 to 60 °F) to stimulate spawning. The breeding season lasts from the end of fall until spring. When the female is ready for breeding, it emits an odor that the male recognizes. After the love parade, the male deposits spermatophores (a kind of jelly containing spermatozoa). The female then comes to rest on this jelly and the fertilization takes place directly in its belly. Spawning can start from 1 to 3 days after these events.Spawning can range from 100 to 1500 eggs, with an average of 300. Incubation lasts about 14 days. Young fish will be adults at the age of 18/24 months. Note that females produce eggs even without the presence of a male. However, it will be beneficial for them to meet a male from time to time to expel their eggs. If you do not want to farm, remove the eggs from the aquarium. Which aquarium for the Axolotl? 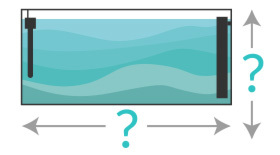 The ideal form of aquarium will be the one that will offer the most space on the ground: plan at least 1 meter long by 40 cm wide (39 by 16 inches). 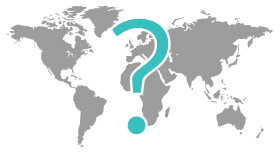 The height of water will be at least 40 cm (16 inches). 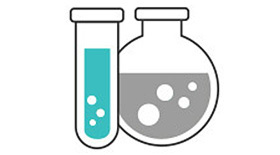 Ideal water parameters: temperature at 17/18 °C (62/64 F), pH at 7.5/8, GH at 11/12 °dGH. Note that given the temperature, heating is completely useless. On the other hand, it might be necessary to invest in a cold group. Avoid gravel, glass balls, pebbles because this batrachian could swallow it inadvertently and this could cause serious health problems (this problem is quite common!). Choose a very fine sand (2 mm, and up to 4 mm for individuals over 20 cm (8 inches)) and not sharp, if possible dark or natural colour. Spread a layer of 5 cm (2 inches) at the bottom of the tank. 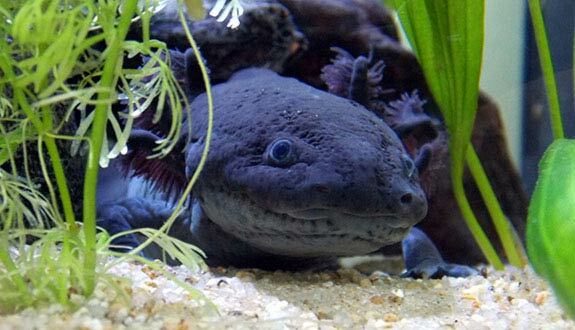 Never put nutrient soil underneath as it is toxic to Axolotls. 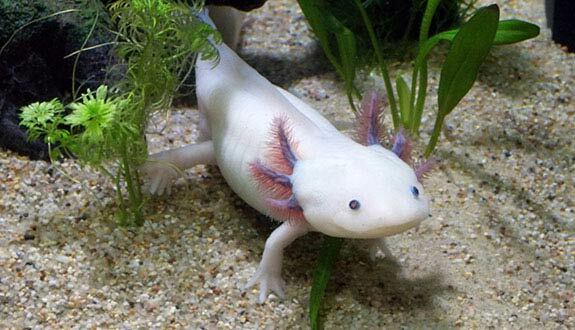 For decoration, avoid overly projecting roots or sharp rocks because Axolotls often injure themselves. First of all, they do not like the current and prefer stagnant water. Choose the filter at the minimum power to ensure a good water quality (1 times the volume of the tray per hour). Do not hesitate to «break» the current at the exit of the pump against one of the walls of the tank, or to use a pierced cane ... To keep a good quality of water, complete with many plants and make large and regular water changes (20% minimum each week). Feel free to siphon the bottom of the tank on this occasion to clean it. The water used can be that of the tap, that you will let rest 24 to 48 hours to allow the evaporation of the chlorine. For decoration, try to «hide» them (the fish of course)! They will feel safer if they have a fallback solution available! Lighting is not mandatory (nocturnal animal). If you are installing a lighting system (necessary for plants if your bin is closed for example), sift a lot with floating plants. It is best to leave the aquarium open: this will allow better ventilation, the water will remain «cold» and the plants will have brightness! On the plant side, choose plants that can live in rather cold water and not too demanding in lighting. For this, opt for Anubias, Lemna minor, Ceratophyllum demersum, Cryptocoryne, Vesicularia, Echinodorus, Groenlandia densa, Microsorum pteropus, Java moss, Java fern. 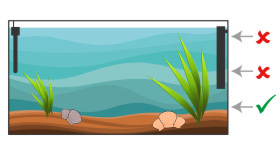 Since the bin is open, you can also choose semi-submerged plants, such as Chlorophytum for example. The roots are to be avoided because the tannin which they release can be toxic for the Axolotls (opt for their alternative in resin!). 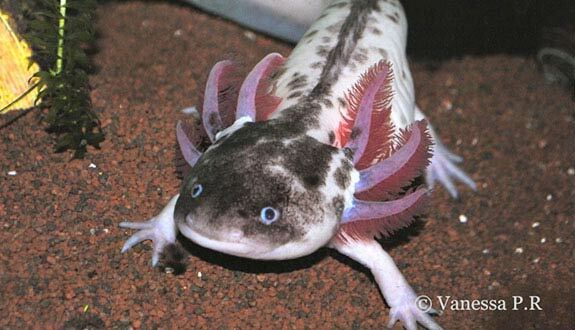 Its name «Axolotl» comes from a word of Aztec origin that means «water dog». It can spend all its life and breed in the larval state without ever going to adult stage! In fact, in aquarium, it lives completely immersed and thus promotes the development of its gills (juvenile organs). This ability is called «neoteny». 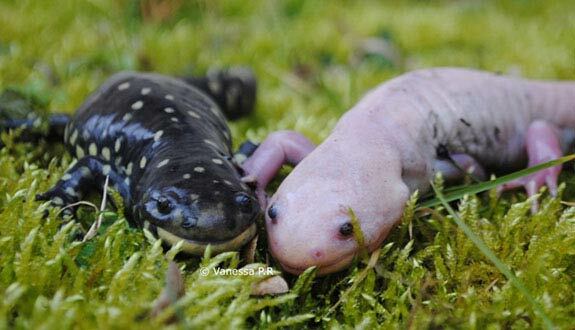 There is a method to move Axolotl to the adult salamander stage in captivity, but it is still quite risky. In addition, successful metamorphoses are very rare. It is still necessary to explain it to you. This method involves placing the Axolotl aquaterrarium in which will gradually lower the water level. At the same time, it will be ensured that the ambient humidity is very high by an automatic misting system or by manual sprays. We will also increase the temperature. 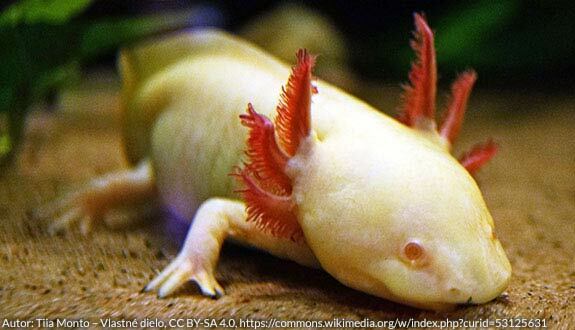 Thus, by preventing drought, Axolotl will begin to develop its lungs (adult respiratory organs) and switch to terrestrial mode. Unfortunately, it is observed that most of the individuals sold in the trade have lost this faculty of metamorphosis. This process can very badly end (by the death of the animal) and is exclusively reserved for experts! Be careful ! The Axolotl has the incredible ability to reconstruct damaged parts of the body: paw, tail, eye, and even part of the brain! Unfortunately, it is critically endangered in its natural environment. Normally, all the animals sold in the trade are therefore from breeding. It sometimes goes into «ghost» mode. It then becomes very pale, completely white (even the gills). This may be due to intense rest (only during the day) or poor water parameters. Handle your Axolotl only in case of extreme necessity! Indeed, it stresses very quickly and manipulations are to be avoided as much as possible. Chimera (half-pink half-brown). 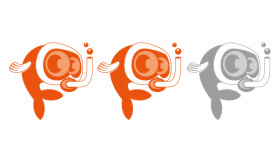 The latter results from the fusion of 2 Axolotl embryos of different colours.